Fire crews worked Wednesday to protect summer cabins in north-central Washington after two large wildfires merged and continued to grow. The fires have burned more than 74,800 acres, or nearly 117 square miles, of national forest northeast of Winthrop and about 18 miles southwest of the Canadian border, fire information officer Tom James said. Nearly 2,100 firefighters were assigned to the blaze, which was 10 percent contained. "The weather has been looking pretty good. The humidity is up and the temperature is down a little bit," James said. "The winds have been fairly calm today as well." In eastern Washington, firefighters did not expect much growth in a fire that burned more than two-thirds of a square mile and destroyed nine structures about 40 miles north of Spokane. Authorities were still determining how many homes were among buildings damaged, said Steve Harris, fire information officer for the state Department of Natural Resources. A handful of homes remained evacuated. "It's pretty well burned out, and we are doing mop-up," Harris said. The fire started as a result of people burning trash, Harris said. No charges had been filed, and Harris could not yet say whether the people responsible would be billed for the costs of firefighting efforts. Officials estimated damages would exceed $500,000. In central Washington, a fire near Stehekin on Lake Chelan was 30 percent contained at 4,200 acres, or about 6.5 square miles. Fire crews continued trail-protection efforts along the Entiat River to protect against a separate blaze that has burned 4,100 acres about 40 miles northwest of Entiat. Meanwhile, firefighters said they expect to have the larger of two brush fires that have blackened at least 1,000 acres in Riverside County, Calif., contained by Thursday morning. The blaze has charred about 800 acres near San Jacinto. Meanwhile, a fire near Banning that blackened 200 acres has been fully controlled. It was sparked when a bird flew into power lines. 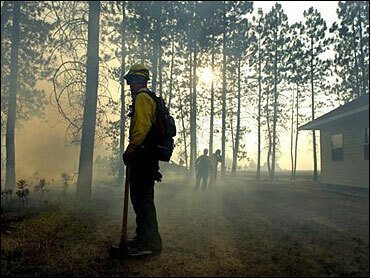 New timber fires are stretching crews who have been battling dozens of blazes in the rugged Idaho backcountry. One of those blazes, the Boundary Fire, closed a launching point for rafters on the popular Middle Fork of the Salmon River. The Boundary Fire is one of 29 blazes sparked Tuesday in the Salmon-Challis National Forest by a band of dry lightning storms. Crews quickly snuffed out some of the blazes, while they circled several others, but the Boundary Fire remained nettlesome. Forest managers on Wednesday closed a road to a northern launching spot on the Middle Fork — four days before its seasonal closing date on Sunday — and evacuated a campground in the area, said Kent Fuellenbach, a Salmon-Challis spokesman. An eight-person team of smoke jumpers parachuted into the fire area late Tuesday, but a wall of flames and erratic winds hampered that crew's ability to stake a camp, Fuellenbach said. Crews will fight the blaze with aerial water drops until a ground team can move in, he said. Another new blaze, the Garden Creek Fire, was burning about 20 miles from the remote village of North Fork. It made runs up densely forested slopes on Wednesday and threatened to torch a historic Forest Service fire lookout. "It's been so busy in dispatch, just moving resources around," Fuellenbach said. "We're talking about a forest here that is 4.3 million acres." Also in the Salmon-Challis National Forest, brisk gusts pushed the Potato Fire into three new square miles of rugged forest, raising the total area burned to almost 14 square miles. The fire has burned since July 27 in conifers that run up the high peaks of the Sawtooth Mountains about seven miles north of Stanley.